It had been a while since I walked down the stretch of R Street between 15th and 14th. But on a leisurely stroll home last night with some friends, we really weren’t thinking about watching our backs. I mean, it was the Fourth of July! Everyone’s in a good mood, right? No need for anyone to be jerks, let alone hostile and violent jerks. 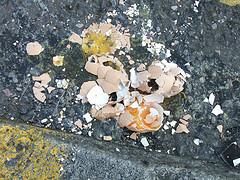 In hindsight, it shouldn’t have surprised us when the first egg hit the sidewalk in front of us. I’ve avoided that block for years at night precisely because of incidents like that. There were probably some thirty people hanging out on the opposite side of the street, all just glaring at us like a gauntlet. The fact that we had a dog didn’t deter them from throwing about four eggs at us. At least they weren’t rocks. The glow of “we’re all Washingtonians together in a new beginning” has obviously faded, or they never felt it to begin with. I don’t understand why people would waste perfectly good eggs to throw them at strangers on the street. I really, really don’t get it.